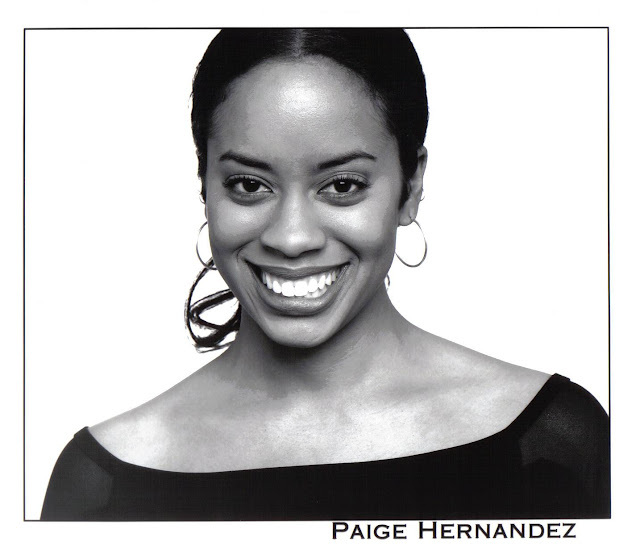 Paige Hernandez will participate in the Breaking Glass forum at McCaw Hall on July 28. Seattle Opera continues its conversations on race and equity through Breaking Glass: Hyperlinking Opera & Issues on July 28 at McCaw Hall. The free forum, part of a larger national tour, is curated and produced by the Glimmerglass Festival in Cooperstown, New York. Following the meaningful community conversations surrounding Seattle Opera’s Madame Butterfly in summer 2017, and right before Porgy and Bess in 2018, Seattleites can get a view of race and equity in opera on a broader scale outside of the Pacific Northwest. Breaking Glass opens the door to a frank conversation about how art is produced in an increasingly diversified America, who has the right to tell whose story, and what roles social justice plays within the artistic mission of an opera company. The panel includes Tazewell Thompson, librettist of the opera Blue about a Black family whose son is shot by the police, Naomi André (author of Black Opera: History, Power, Engagement), Grammy-winning maestro John DeMain of Porgy and Bess, and finally, Paige Hernandez, creator of Stomping Grounds (2017) which blends hip-hop and opera. A multidisciplinary artist and educator, Hernandez has taught throughout the country to all ages and disciplines, to date, reaching approximately 10,000 students in over 100 residencies, workshops, and performances. 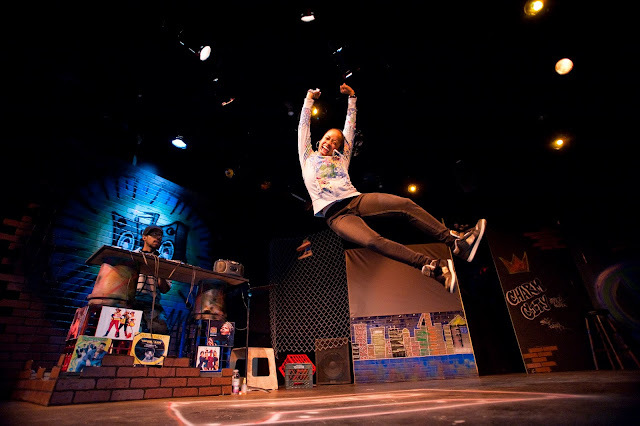 As a performer, choreographer, and hip-hop advocate, her work has been seen at The Kennedy Center, Wolf Trap, Imagination Stage, Lincoln Center, among other stages across the globe. Hernandez tours internationally with her company B-FLY ENTERTAINMENT, promoting original works such as Liner Notes, Havana Hop and Paige in Full: A B-girl’s Visual Mixtape. She was named a “classroom hero” by the Huffington Post for her outstanding arts integration and work with STEM initiatives. Full bio here. First of all, I just wanted to say I’m excited to hear you speak at the Breaking Glass series next weekend! Can you talk to me about your involvement with the event and why you’re participating in these conversations? Breaking Glass is a national forum that the Glimmerglass Festival has incited as a way to keep the dialogue going surrounding opera and social issues. I fit into the fold because I was commissioned to write a “hip-hopera” (Stomping Grounds) for the Glimmerglass Festival. I tried my best to explore topics of race, identity, immigration, displacement, and issues dealing with home. Being able to talk about my process as a librettist and as a Woman of Color artist is just insightful. It’s nice to be able to talk about my experience in the opera world. In the Breaking Glass forums, we compare my experience to Tazewell Thompson’s. (Thompson is currently working on the story of a Black family, Blue) that premieres next summer. In the forum, we talk about how our two projects have the same intentions but different processes. Tell me more about how hip-hop and opera intersect in your work Stomping Grounds. Stomping Grounds essentially looks at the concept of home; looking to, coming from, and moving away from, home. I told the story through those perspectives, through immigrants, refugees, and people who have been displaced. Then I put it into a big metaphor for how these different perspectives could intersect. For me, this was through a coffee shop that’s facing gentrification. Sadly, gentrification is wildly popular in urban coastal areas like D.C., where I’m based. Stomping Grounds tells the story of a neighborhood coffee shop facing turmoil in the form of gentrification. 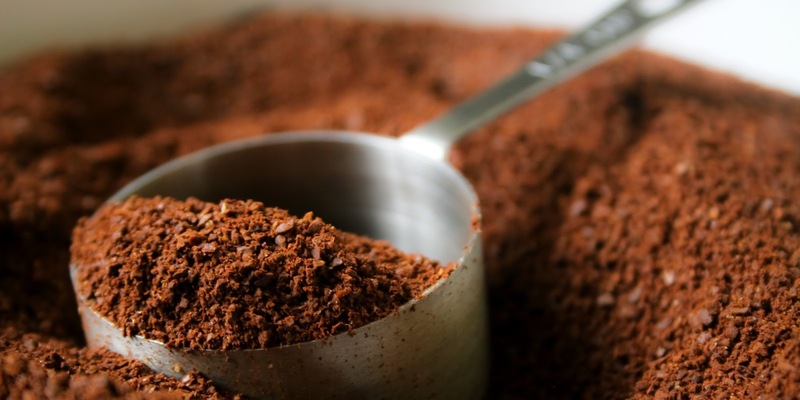 In this story, the coffee-shop owner is a Cuban woman, and her love for grounds is all around: for her, I mean coffee grounds. She also reads her fortune in her coffee grounds—and also for the grounds she has come to love, the ground that she stands on. We learn that she is fighting a developer, an African American gentleman. We go through the ups and the downs of the story, only to find out eventually that the answer to her problem, to her being displaced, comes from her digging into her own ground, in the yard at the coffee shop, where she finds relics from the Underground Railroad—things like slave shackles and fishing baskets—and because she has found these things, her coffee shop is now a historical site; it can’t be torn down or be developed. It’s all linkage. She is upset with this African American man and he is upset with her, but we’re all connected. We’re all connected through the ground. I wanted to tell that story with two genres of music that I thought could really help to illuminate the issues at hand. Hip-hop naturally brings a fresh youthfulness and opera brings a very dramatic storytelling element. It was great to be able to write something that could lean on both of these genres equally, that was important to me. When you experience the piece, it truly is 50/50 hip-hop and opera. I wanted to make sure that each art form could shine. What do you think opera can gain from hip-hop? In my process, hip-hop helped the performers to be more well-rounded. We were doing classical music, but we were also looking intentionally at rhythms and music, and the African diaspora specifically. I saw how much hip-hop and opera played off of each other, played in tandem, but more than anything, how this mashup cultivated a new, young audience. We were able to tour Stomping Grounds to several different schools throughout New York City, as well as New York state. We visited middle schools, high schools, colleges and they were eating it up. It was just really nice to be able to say this was their first exposure to opera; it created a bridge to get their appetite going for more opera in their lives. 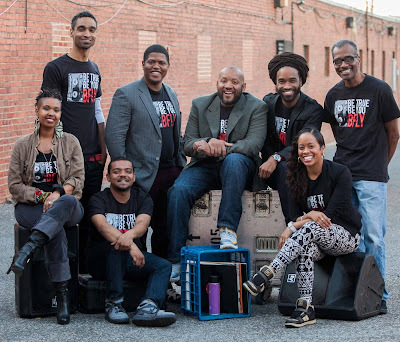 Hernandez with the cast and crew of Liner Notes, a "live musical journey through hip-hop's many intersections." She wrote, produced, directed and performed in the production. In your view, how do people tend to perceive opera? How do events like Breaking Glass impact this reputation? Unfortunately, everything I had assumed about opera is still pretty much correct. From my first experience with opera in 2017, it felt very elite and exclusive. I wasn’t sure if my voice would be heard or if my expertise, which is hip-hop, would be championed. I definitely got a lot of questions, side-eye, and push-back about my artistic genre, which is too bad. But, my experience creating an opera also showed me that this is an art form steeped in tradition and history. Some purists want to keep it that way. Some people are excited about engaging with the art in pathways toward progress or inclusivity. I think that is something the Breaking Glass forum, as well as the podcast, are attempting to crack at, to break that glass and say, “We’re out here! We’re well aware of the challenges. We want to make everyone else aware so that we can start to move forward together.” Opera is a genre that can still catapult social change. 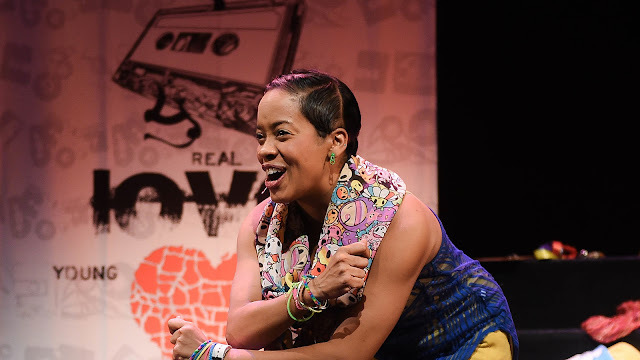 Hernandez used her background in hip-hop to tell the story of her personal path to self discovery in Paige in Full. What was your first experience with Porgy and Bess? (We perform it shortly after Breaking Glass). Well, it’s interesting because my husband is a jazz musician (upright bassist). And I think my first live experience with Porgy and Bess was watching him perform “Summertime” with a jazz vocalist. After that, I saw it on Broadway with Audra McDonald and Norm Lewis. Then, Glimmerglass produced it last summer (the same production Seattle Opera is about to present). It’s was almost was like Stomping Grounds and Porgy and Bess were in tandem. We actually encouraged that; people could leave Catfish Row, and then come on down to modern America, USA in my piece. 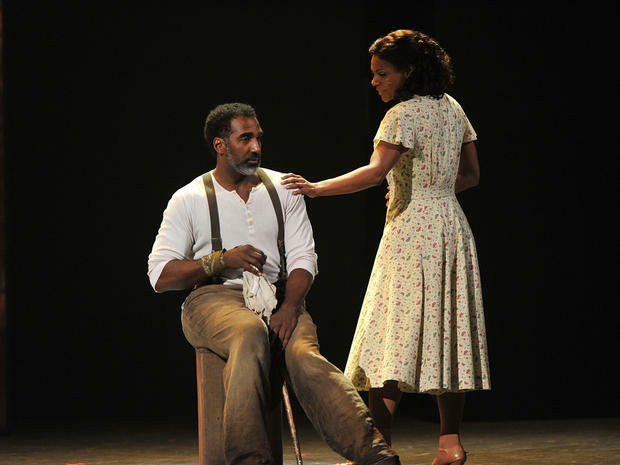 Audra McDonald and Norm Lewis in the 2012 Broadway revival of Porgy and Bess. How does Porgy make you feel today? I have a lot of complicated feelings about that piece. For representation reasons, I think it’s great. I understand that it’s the only access and entrypoint for a lot of artists. For those reasons, I support it. But the story feels dated to me, some of the language and text, as well as the archetypes and stereotypes; I find to be a bit problematic. When I see the show, I very much appreciate the art at hand, which is the singing, the staging, the directing and the lights—those are things I tend to focus on. I focus less on it being a story about People of Color written by white people. To me, it just reads as unauthentic. It’s a tough pill to swallow for me. Is it possible to love something while understanding its limitations? I’m noticing that I am changing. Because of this current societal and political climate, I have less of a tolerance for it. I think 10 years ago, I would have been fine with it being produced forever and ever and seeing it multiple times. Now, I feel like enough already. There’s just so much of that already there. I’m just interested in new ways to tell that story. I see that you have been very active in youth education and arts programming. Tell me about this passion. Absolutely. I am a big advocate of arts education, using the arts to teach curriculum and life skills, and to help in a young person’s social and emotional development. The arts not only saved my life; they gave me a life. I had teaching artists all around me growing up. I had the opportunity to go to a performing arts high school where the teachers were invested in that way. It’s a mission of mine to make sure that education is always present in the work that I do. I always want to be engaging with youth and with the community. Hernandez performing Havana Hop, which was showcased at the International Performing Arts for Youth in Montreal, Canada. One thing I noticed growing up was, with the arts I was exposed to, things felt dumbed down. It was as if they thought we weren’t ready to discuss certain things or that we weren’t mature enough. So I like to give youth something sophisticated to gnaw on instead. I like to provide awareness. I’m not being preachy. I’m not trying to convert or give opinions. I’m just trying to give them all the information they need to make choices and form their own opinions. We often hear the term “representation matters.” What does representation in the arts world mean to you and your production company B-FLY? Representation, to me, means just that everyone is represented. With my company, B-FLY Entertainment, I work really hard to make sure that our work is multicultural and multigenerational. It’s trying to tap into representation onstage that I just hadn’t seen before. Even with this opera, for casting, it was very difficult for the traditional casting process because I wanted a woman who would represent my main character in a way that was grounded and also wasn’t some Disney cut-out ingenue. Instead, she was a woman with curves and flaws and problems, but also was nuanced, complicated, and intricate. It meant that she would be a mezzo and have a deeper voice, where my composer wanted a higher voice. These were some of the things I noticed right away. For me, at the end of the day, it was still about representation. I had never seen a full-bodied Latina in a lead role in opera, let alone in theater. So it was a mission. But not just that, it’s not just about gender, it’s also about race, even gender identity. All of those things are really important to me. I found that, more than in theater, which is my background, opera keeps casting in a box. I just wanted to break out of that. So, I picked performers who weren’t necessarily the cream-of-the crop in auditions, but I was able to pull out of them brilliant work during the process. In the future, I’d like to see the opera world be more willing to take risks to make representation a priority.